The more time I spend in my kitchen, the more I appreciate the notion that some of the best recipes are the simplest. 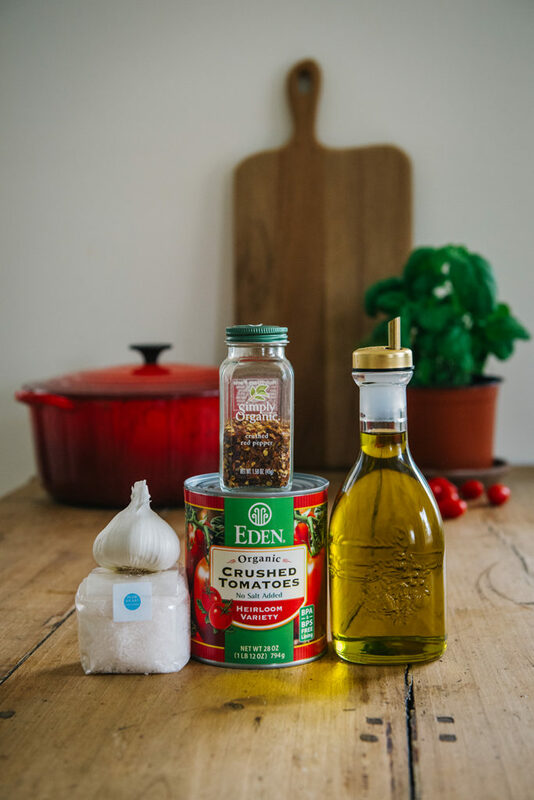 With only 5 ingredients and a short cooking time, this sauce has become my go-to on school nights or when I’m crunched for time. I’ve made this recipe so much over the past decade, I couldn’t possibly count! Plus, it is the one my children know and love — a comfort food they will forever remember. Originally discovered in Heidi Swanson’s, Super Natural Cooking, I’ve only marginally adapted her version to suit our tastes; namely adding more garlic and cooking it slightly longer (I think it develops a better flavor that way.) But by all means, it can be ready in 20 minutes! The recipe can also easily be doubled and frozen. I usually serve ours over penne or rigatoni, but it could also become the base of a pizza, layered into a lasagne, or used as a dipping sauce. 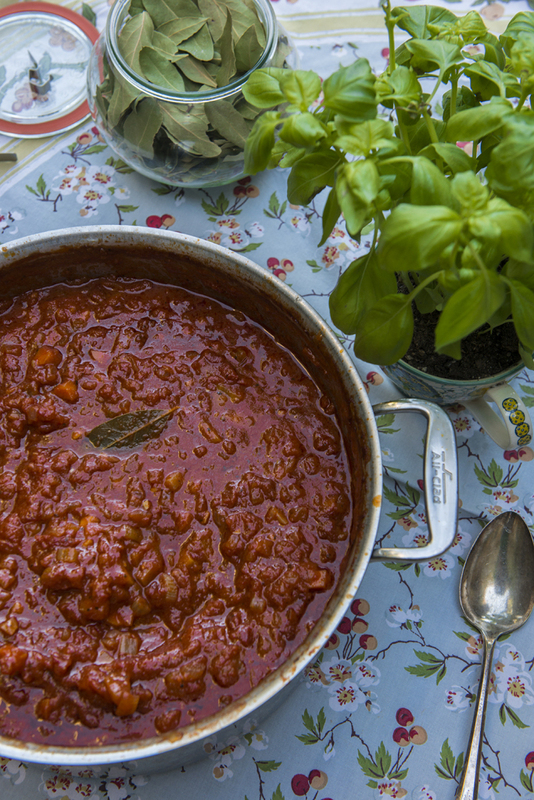 A quick, 5 ingredient tomato sauce. Prep all ingredients, including finely mincing the garlic cloves. In a saucepan on medium-low heat, add olive oil, salt, red pepper flakes and garlic. Cook gently for about 5 minutes or until garlic has softened. Do not allow garlic or pepper to burn! Add the can of tomatoes and stir well. Cook uncovered for 15 minutes, stirring regularly. (If I have time, I cook mine for at least 30 minutes or more to develop the flavor.) Serve with pasta, use as a pizza or dipping sauce, or freeze for later use. When I first started cooking, nearly everything I made was Italian. I had worked in a family-run Italian restaurant for many years and had tried (unsuccessfully) to replicate their marinara at home. To me, it was the quintessential red sauce, but like everything else food-related, that’s all a matter of personal taste. 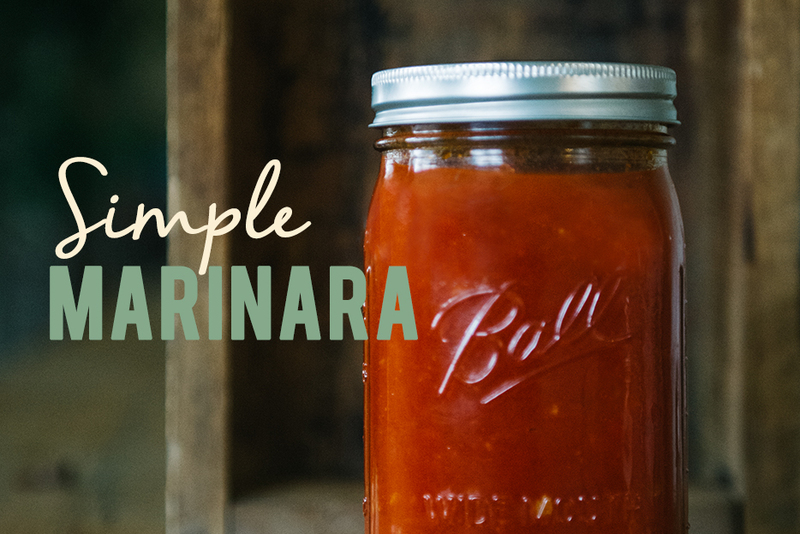 There are many disagreements on which ingredients should or should not be included in a true marinara sauce. I’ve tried several over the years but keep coming back to two particular sauces; one slow and one fast (I’ll share this recipe soon). They are both staples in our house and I couldn’t pick a favorite between them if I had to. 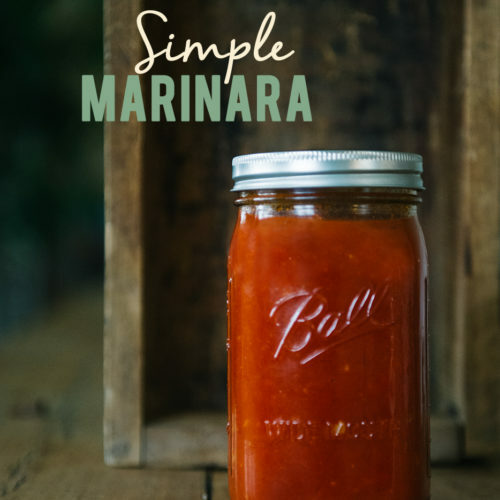 I’ve been making this slow-cooked marinara almost every month for well over 10 years. It’s not the same as the one at my old restaurant but it certainly evokes a classic Italian Nonna’s recipe. This one is a chunkier version, with a proper soffritto, and a depth that can only be achieved by simmering on the stove for at least 5 hours. I prefer to make a huge pot so that any extra can be frozen or jarred. It’s such a great time saver on busy nights! Chop onion to a small dice and mince garlic finely. Heat oil briefly in a large, heavy bottomed pot. Add onion and garlic, season with salt and pepper and sauté until nearly translucent. In the meantime, chop carrots and celery (small dice) and add to pot. Season with salt and pepper again then sauté until the carrots and celery have softened (knife easily slides through). 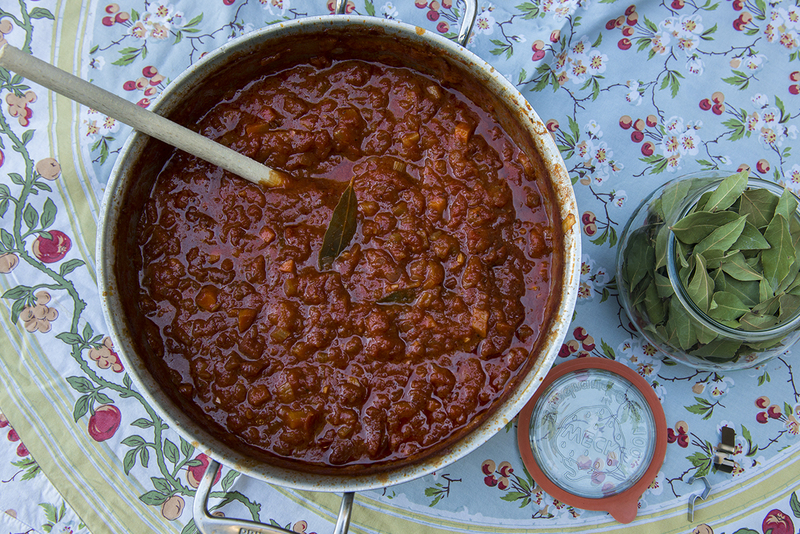 Add canned tomatoes and bay leaves. Stir sauce really well. Bring to a soft boil then reduce heat to a simmer. Simmer uncovered for 5 hours or more. Stir regularly. Sauce should thicken and reduce a bit. Cool, then remove bay leaves before using or storing. Optional: Once the sauce is finished, you can add up to 6 TBL of butter to round out the flavors. 180360 is the photography company and blog of Kim Hudson. 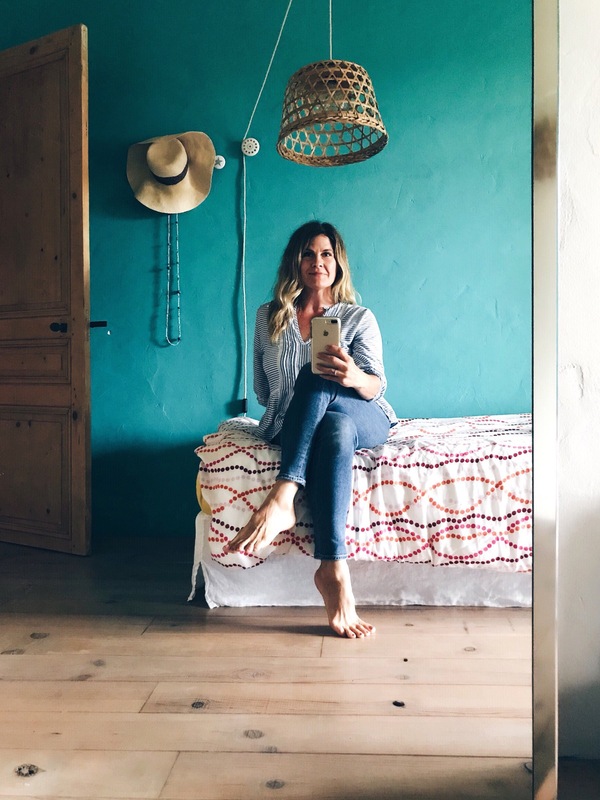 Here you will find her online portfolio of portraiture, travel, and food images; as well as musings on healthy living, music and lifestyle inspiration.